Memberships for TSA agents, desk workers in Washington, D.C. The Department of Homeland Security (DHS) is spending more than $450,000 on gym memberships for TSA agents and Immigration and Customs Enforcement (ICE) employees who work desk jobs at a procurement office in Washington, D.C.
Last month, DHS bought gym memberships for ICE workers in its Office of Acquisition to boost their morale and "improve working conditions." "As part of the agency-wide Health and Wellness program, sponsored by Department of Homeland Security/Immigration and Customs Enforcement (ICE), has a requirement to provide ICE employees in Tech World Office at 801 I Street, NW Washington, DC, 20536 with access/membership to a fully comprehensive state-of-the-art health club facility," the June solicitation said. 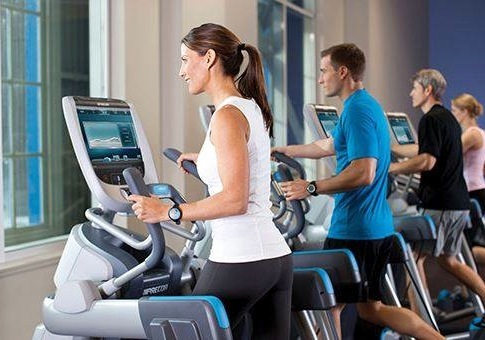 On July 7 the agency announced it had purchased 236 gym memberships to Vida Fitness, which describes itself as "more than just a gym," offering an "Aura Spa, Bang Salon, Fuel Bar, Gear Shop, Endless Pools, luxurious locker rooms, and the rooftop Penthouse Pool and Lounge." The government will spend an estimated $400,000 for two-year memberships at the upscale Vida gym located in the Renaissance Hotel on 9th street. "VIDA Renaissance has quickly gained the reputation as one of the most popular hotel gyms in the country and is home to many visiting celebrities and dignitaries," according to the gym’s website. "The Renaissance location features our most expansive Aura spa and covers over 10,000 square feet of space. Our full-service locker rooms are stocked with a variety of complimentary products from Bang Salon." DHS said the contract with Vida was necessary because of its location, so that employees can work out during lunch. The contract had a strict requirement that the gym must be within a tenth of a mile from ICE’s Office of Acquisition headquarters located at 801 I Street. The office is responsible for ordering handcuffs, guns, ammunition, and computers for the agency. "This 1/10 (.10) mile walking distance is a critical requirement, in that participating employees will be able to utilize the facilities primarily during the mid-day lunch period, making the location/distance of the facility a vital consideration," the agency said in a document providing justification for the contract. On Monday, the Transportation Security Administration (TSA) announced the purchase of up to $52,650 for gym memberships for employees working at Phoenix Sky Harbor International Airport in Arizona. The memberships are meant for 10 to 75 employees, though the contract did not specify who would receive one. Requirements for the contract included at least eight treadmills, four bicycle and elliptical machines, "Olympic style weight lifting equipment," a squat rack, and membership IDs that "will NOT reflect any personnel names." DHS is not alone in providing gym memberships as a benefit to its employees. The Defense Advanced Research Projects Agency (DARPA), which is responsible for creating new technologies for the Pentagon, spent $369,000 for Gold’s Gym memberships and $654,210 for Sport and Health memberships in May.